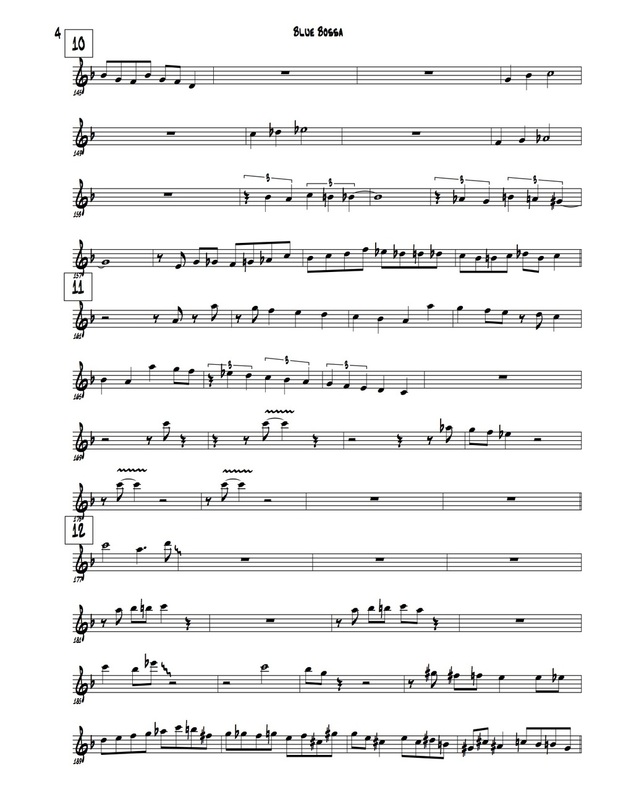 Here's a recording of my recent composition for the MSM Jazz Philharmonic. This was such a unique and amazing experience. Please enjoy! This semester has been a busy one at school, especially since I took off a few weeks off to play "Tappin' Thru Life" with Maurice Hines and the DIVA Jazz Orchestra in Philadelphia, but the end is in sight! 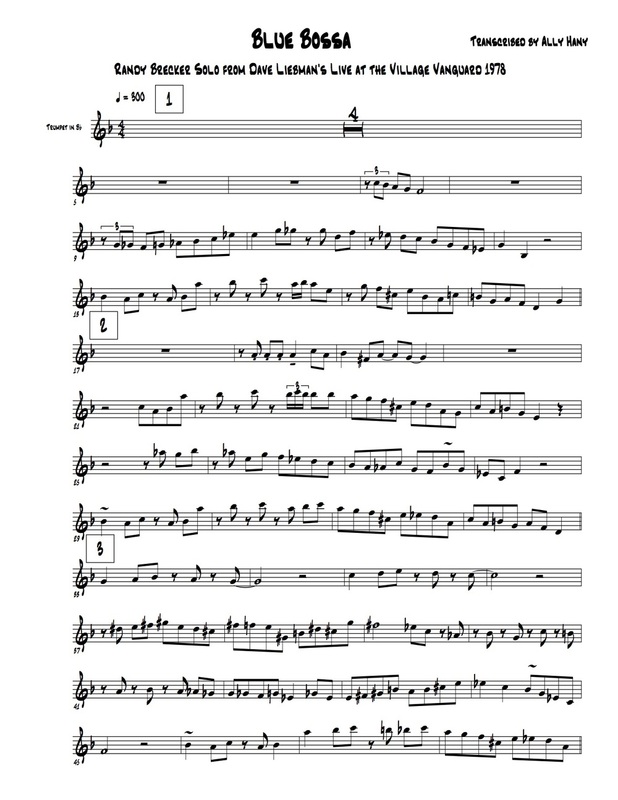 Over the past few weeks, I have recorded several new tunes and arrangements, as well as a few standards, and I will be posting them here periodically over the next couple weeks. I'll be posting the tracks on facebook as well, but be sure to check back here for updates! Here is a brand new original of mine recorded by the Quartet last week. Hope you enjoy! For the second installment of my summer video series, I'm posting a brand new tune I wrote. I was lucky enough to record it with my fabulous band at the Boysie Lowery Living Jazz Residency a few weeks ago. It features: Ally Hany (Trumpet), Julian Jayme (Guitar), Kristin Monroe (Trombone), Joey Pearlman (Bass), and Sebastian Chiriboga (Drums). Hope you enjoy! Hard to believe that it's been a whole year since we hit the studio to record Journeys Ahead, which also means it's been a year since I moved out of Denton and relocated to the Big Apple! To commemorate the occasion, here's a little chunk of my favorite tune from the album, Atlas. This track features some incredible percussion work by the amazing Connor Kent. I think he played and recorded 6 or 7 different instruments just on this one track (using his superhero skills, of course)! also on iTunes, Amazon, or CDBaby. I know I haven't posted a new video for the Summer Video Series in while, but I promise the next one will make it all worth while. Check back in the next day or two for a brand new composition, featuring some amazing young composers and musicians I had the pleasure of working with at the Boysie Lowery Living Jazz Residency in Wilmington, DE. I'll also post a bunch of news regarding my time at the residency including many great performances and a couple very cool radio interviews! 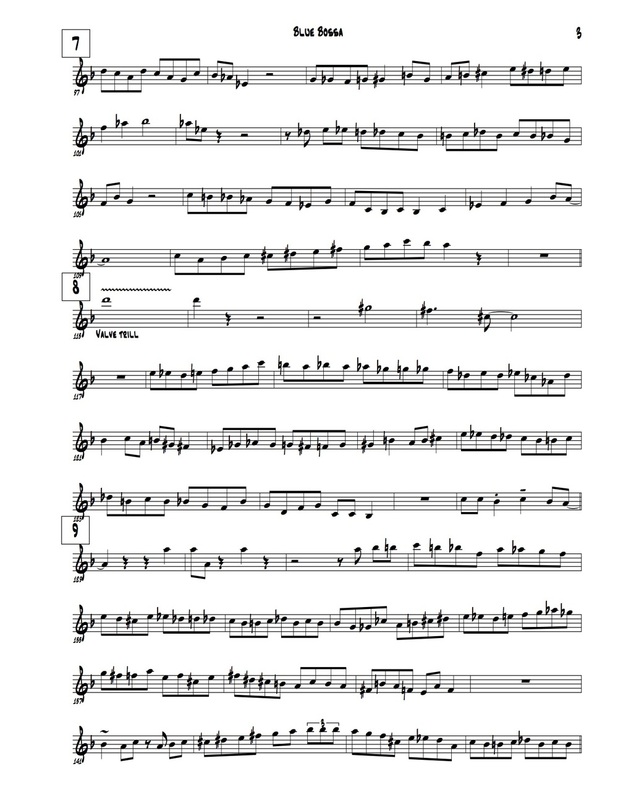 For the first video of my summer video series, here is a transcription I recently did of one of my favorites, Randy Brecker. 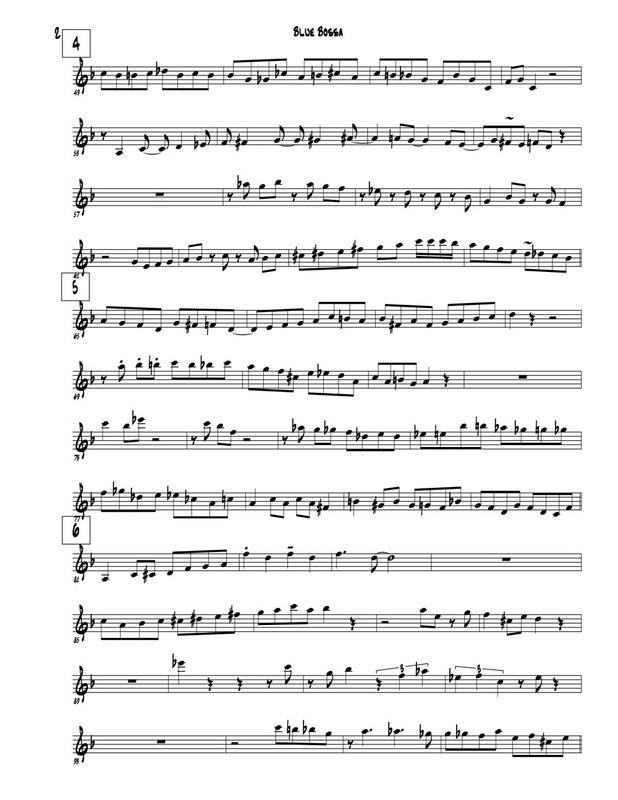 This is his solo on Blue Bossa from Dave Liebman's wonderful record, Pendulum: Live at the Village Vanguard 1978. Here is the written version, if anyone would like to take a look! I also have a detailed analyzation, and if you're interested in taking a look at that, please contact me (through the contact form on this website), and I can pass it along as well. Be sure to check back in a week or two for the next video! I'm very excited to have just finished the first year of my Masters at the Manhattan School of Music, and to finally have some time to update this blog! The Jim Widner Jazz Camp @ the University of Missouri- St. Louis (June 5-10th) The Jim Widner Big Band will perform concerts daily. Please check the schedule for times and locations. Boysie Lowery Living Jazz Residency held in Wilmington, Delaware (June 12-26th) We will be performing A LOT around the east coast during these two weeks, so please check back for specific dates and times as the date grows closer. I will be starting a video series on my website this summer, starting with one later today. I should have a new video out every week or two on this news page, so be sure to check back! I hope to also book a few shows with my quintet for later in the summer, so I will update the events page as soon as I get everything finalized. Album Preview and other exciting news! 3. The album can be pre-ordered on this site, under the 'Purchase Journeys Ahead' tab. Be sure to order yours today, so you can receive it sometime next week! It also will make a great holiday gift, so make sure to order extra copies for your friends, family, co-workers, and neighbors. Journeys Ahead, my debut album, is fast approaching it’s completion. The tracks are now in the final phase of the mastering process and the art work is being finalized as well. I’m very excited to announce the official release date, which will be November 22nd! A tour will accompany the release of the album, beginning in St. Louis, and continuing on to New York, Dallas, and Denton, Texas. An official schedule of all these release events will be published in the upcoming weeks, as well as previews of the music and art work, so be on the look out for more posts! I’m very excited to finally be releasing my music, and I would like to thank everyone for their continued support! Hello and welcome to my new website! I will update the news page monthly with information about shows, recordings, and other happenings related to jazz and trumpet.